prove origin, and prevent tampering. After completing your order online, the identifying information included in your Certificate will be verified by our Vetting Team. 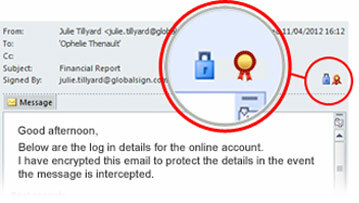 Once verified, you will receive an email with a link to download and install your Certificate. Depending on the information included in your Certificate, the length of the verification process will vary. PersonalSign 2 Pro/Department - Issued within two to three business days unless supporting documentation is needed during the vetting process. 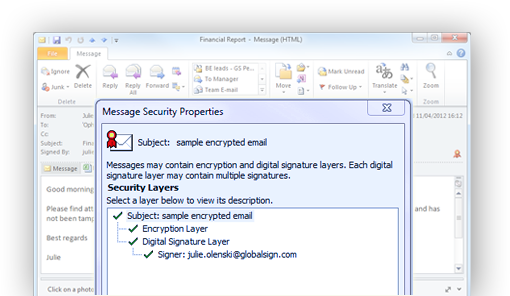 GlobalSign's PersonalSign Certificates employ the Secure/Multipurpose Internet Mail Extensions (S/MIME) protocol to digitally sign or encrypt emails. S/MIME Encryption provides message integrity, authentication, privacy via data encryption, and non-repudiation via digital signatures. Most mail clients support S/MIME, such as Microsoft Outlook, Thunderbird, Apple Mail, Lotus Notes, and Mulberry Mail. For a detailed summary of S/MIME compatibility between email clients, please see our S/MIME White Paper. 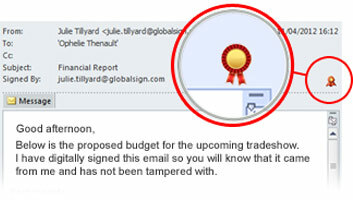 For organizations looking to implement an enterprise-wide secure email solution, EnterprisePKI (ePKI) is the answer to managing multiple PersonalSign Certificates for S/MIME. ePKI offers simplified deployment options and full Certificate management capabilities, so administrators can issue, renew, reissue, and revoke PersonalSign Certificates throughout their organizations. ePKI offers significant cost savings over purchasing individual PersonalSign Certificates and robust reporting features allow organizations to monitor Certificate activity from one centralized account.